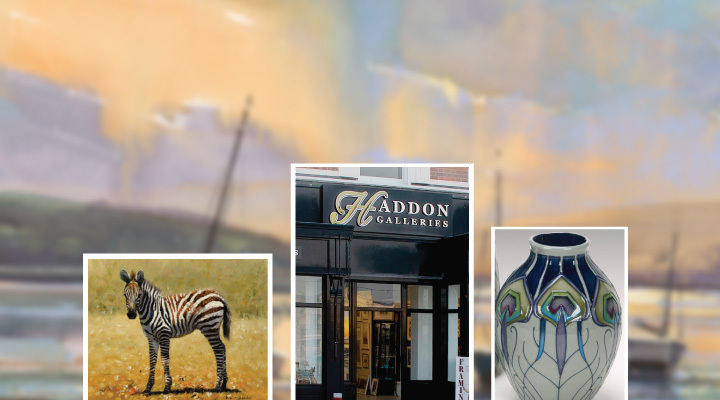 Haddon Galleries in Torquay has recently won this year’s Fine Art Retailer of the Year and is celebrating by hosting a very special day on Saturday 2 November at their gallery on Torquay harbourside. The event is not only to celebrate Haddon’s recent achievement but also to raise money for local charity, Torbay Holiday Helpers Network (THHN). The THHN gives free holidays to families who have seriously ill and bereaved children, recently bereaved families, couples who have lost a child and to families who have a terminally ill parent. The gallery has all sorts planned for the event. From 2pm to 9pm Laura Wall will be at the gallery. Laura is a local artist who won the Fine Art Trade Guild’s “Best Up and Coming Artist” for 2013. Laura also writes books and her series of books about “Goose” are delightful tales of a little girl called Sophie who meets Goose on a trip to the park and they become firm friends and go on all sorts of adventures together. During the event Laura will be painting and signing her artwork and books. Artist Mike Jackson, famous for painting Hoodies, Mods and penguins, will also be painting in the gallery from 2 pm. He will be signing any of his prints for a small donation to THHN. From 7pm onwards it’s party time with live music from Noteable Duo, a raffle and the opportunity to meet some of Haddon’s most popular artists. Waitrose have also got involved and donated some delicious nibbles and refreshments for the event. At 7.45pm there will also be an auction of some incredible items with some stunning artwork on offer. THHN Fundraising Manager, Brian Lewis, said “We’re delighted that Haddon chose THHN to support at this lovely event. The gallery is full of fantastic artworks and in a great location so we’re hoping lots of people pop in to say hello and join in the fun throughout the day. With all money from the raffle and auction going straight to THHN, as well as 5% of all gallery sales on the day it’s a great opportunity to purchase something really exciting and know that money will go to help those who are having a particularly difficult time.” The event is open to everyone, the gallery is free to visit and a bumper turnout of people is expected.